The Spirit of the Edict is still with us! Who works wonders on the earth! Behold, the year of the Lord’s goodness which has given us a rare and true celebration: it has been given us to celebrate 1700 years since the day when the Providence of God spoke through the holy Emperor Constantine and freedom and power was given to the Christian faith. This is truly a special year and a special jubilee! For the holy Emperor Constantine was no ordinary Roman emperor, like the others. For his victory was not a victory like others. For his Edict was no ordinary royal decree by which someone, through royal power, is forced to obey authority. On the contrary: it was all special and blessed, it was all so significant and great that we today celebrate the light which shone forth with the Edict of Milan in 313 and with the great deed of the glorious Constantine. Even though the entire Christian world is celebrating, we Orthodox Christians, particularly the faithful people of our holy local Church, are celebrating it with greater joy, for we are honoring the convener of the First Ecumenical Council, our fellow countryman, a man who was raised by our rivers and our valleys, warmed by our sun and fed by our lands. Thus we say to all Orthodox Christians, as well as to all Christians and to our friends from other faiths who grasp the significance of the Edict of Milan: may this spiritual joy and celebration multiply! Our Church rightfully boasts of the holy Emperor Constantine. She does not boast only because he was born here, in the ancient city of Naissus, modern day Nis, but because of all that he saw and accomplished. The Nis of that time was not some village tucked away, neither was it mighty Rome, nor ancient Athens, nor wealthy Corinth, nor cosmopolitan Alexandria. Nevertheless, God’s Providence, which always works ineffably and glorifies the small in great ways, has granted that a man and an emperor, who would grasp in such a way the greatness of Christ and His teaching as did Constantine of Nis, would come from none of these cities. Not being conceited by his descent, he was glorified for his great deeds — as emperor and statesman, but first as liberator, and giver of freedom and follower of the Cross and Christ. That was exactly why he was not driven by the pride of Roman origin, nor the pride of ancient philosophy, nor the arrogance of the Corinthians, nor the indifference of the Alexandrians. Rather, we was enlightened by the Light of Christ’s Resurrection and His victory over death, so that through Christ’s Cross he became greater, more glorious, spiritually more wealthy and a greater cosmopolitan than all of his predecessors. True greatness is seen in the ability to see further and deeper, that beneath the blurred surface we see the clear interior. Such was Emperor Constantine and such was his celebrated Edict which we honor. Seeing the Gladsome Light of the Holy Glory of the eternal heavenly Father, he saw further and clearer than any of his predecessors on the Roman throne. We know today and can freely say that he saw at least 1700 years in the future. For immediately before the glow of the Edict of Milan the Church and Empire were shaken by the Diocletian persecutions, the bloodiest and most perfidious ever. Those persecutions adorned the Church with a multitude of martyrs, but they gave the end of antiquity an unseen cruelty: in an era that boasted of philosophy, culture and civilization, they persecuted, by fire and sword, people whose only crime was that they did not believe in a multitude of gods, but in the One and Only God – the Lord Jesus Christ; only because they did not want to participate in the cult of the rulers but preached love for all men. And just when it seemed that antiquity would ingloriously finish its glorious course in the blood of the Christian martyrs, Constantine came, and also Christ’s victory. There is coming the return to itself of the cultural universe of that time in the revelation of the lasting Christian values, which become lasting values of, above all, Christian culture, and then of every civilization. And all of that was possible only because of the divine foresight of our fellow countryman – Constantine the Great and Glorious. “Recognizing for some time that the freedom of religion should not be denied anyone,” says this celebrated man at the beginning of the Edict of Milan. Never did any emperor before him, and rarely any after him, raise the knowledge of God and the knowledge of man to such a level. For – freedom is the foundation of the existence of all mankind inasmuch as mankind needs to achieve its calling. Man is free because he is godlike, for he is created in the image and likeness of God. It is true that man already abused that freedom with the ancestral sin; it is true that man abuses it all too often in various ways, oftentimes threatening others through his own freedom. But without that freedom he is nothing, he does not feel like a man, for in freedom he is given the awareness of his calling towards a free communion with God. This is related all the more to the freedom of religion. For man is homo religiosus by nature, a religious being, a being that seeks in religion the meaning of his existence. Faith, as the most elevated human activity by which man enters into communion with the living God — therefore, as sacred faith — specifically requires a sacred freedom. For faith gives birth to hope, hope to love, and love does not exist where force reigns. Thus, freedom of religion is the foundation of all other values, of all civilizations and cultures which consider valuable respect for the human person and which live by it. We seek today nothing more nor less than that which the Roman emperor, and later saint, made clear 1700 years ago. But it is a basic fact that man needs to be free to believe and confess as his heart desires and his conscience dictates, hindered by no one. It was not so long ago that this was not possible. There are places not too far from us where this is possible, but many are leaving the faith, not asking themselves at all about the meaning of life in societies that offer them a so-called better life. The holy Emperor Constantine of Nis, Orthodox and European, knew that both of these temptations threaten to destroy not only faith but also society, for a society without basic values is only slightly better controlled than a pack of wolves. The holy Emperor knew and saw that force neither helps one to believe or not believe simply because someone so decreed it. He knew that no society would survive unless it allows every citizen that which is basic — faith, sincerity and freedom. In his Edict which we celebrate today, Saint Constantine was “more modern” and more noble than many of the rulers who came after him, or who govern today, when millions of Christians suffer throughout the world. Having the freedom of a child of God, he knew the values on which it is possible to build a city. Having started out in Nis, at the intersection of East and West, he knew well the good points of both. So he built his capital city in the light of the New Zion, and he gave this capital city the noble ideal on which society can be truly ennobled — the ideal of symphonia or harmony of the Church and the state. The Holy Emperor knew from his own personal experience that neither military power nor the strength of force avails anything unless everything is overshadowed by the Cross of Christ and becomes Christ-bearing. His vision—the vision of victory in the sign of the Cross—became the program for the existence of the Roman Empire after him and of the “Byzantine Commonwealth,” as well as for all of us who share his conviction that Christ always and unfailingly conquers. His vision convinced him of that by which the Byzantine emperors lived continuously for over a thousand years after him, as did the Serbian kings and emperors: that every city and every kingdom must be founded on Christ’s sacrifice and on His Resurrection, but first and foremost—on the expectation of Christ’s second Coming. And we today know that the exclamation “by this sign conquer” is constantly sent out not only to him, but to all. We know that it is only in the sign of the All-Victorious that any kind of victory is possible. Constantine’s looking to the East is the same way we look every day as we await the appearance of our Lord. That is what we see in the Holy Eucharist. It is not incidental that by his Edict of Milan Constantine the Great returned to the Church all the temples and liturgical places. The pagan emperors, in their desire to harm the Church, confiscated the places where the Holy Eucharist was offered, knowing that without the Eucharist there are no Christians, that this was for them their necessary and daily Bread, more necessary for life than anything else. So he allowed the Church to offer the greatest of all sacrifices and the greatest of all offerings—the bloodless Sacrifice of the Eucharist, the Offering above all offerings. This is why the true celebration of the Edict of Milan will always be a liturgical celebration, the liturgical remembrance of the history of our salvation in Christ, as well as of His glorious Second Coming. Having this greatness of our fellow-countryman before our eyes and in our hearts, dear spiritual children, let us strive to be worthy of him, and not merely take pride in having been born in the same city or country as the greatest of the Roman kings. He is known for his true value, his faith, love and freedom—let us be worthy of that faith, that love and that freedom! He was “modern” because he was the first to openly recognize freedom of religious belief to be a fundamental human right—let us use and protect that right, let us give our children education in the pious faith and in church life. If we celebrate our greatest fellow-countryman, let us teach our children what he himself taught his royal subjects, and that is the beauty of the Christian faith. Behold, Constantine was aware of the value and unity of East and West—just as were Saints Simeon and Sava after him, as were Saints Nikolai of Zicha and Justin of Celije, as were all those Holy Fathers of the Church who told us not to choose imposed options and proposed illusions, but the royal path “above East and West. Above all, let us understand that which is at the foundation of the Edict of Milan, and that is the essential, spiritual unity of the a nation and society as the basis of its all-encompassing progress. The Holy Emperor knew Christ’s words that “Every kingdom divided against itself is brought to desolation, and every city or house divided against itself will not stand.” (Matthew12:25) We cannot enter the Kingdom of God alone; rather we enter it in the Community, in the Church, loving each other. Therefore this lesson for us is at the same time a calling for all of us as citizens of this society and this old European country: to be, like the Great Constantine, peacemakers, for we shall be called sons of God. 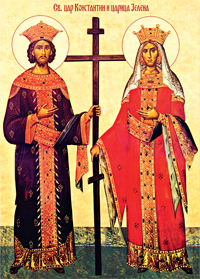 Celebrating today’s commemoration of the Holy Equal-to-the-Apostles Emperor Constantine and his holy mother, the Empress Helen, and rejoicing in the freedom of religion, evangelization, building of churches, confession of Faith and living according to the Christian Faith which is their everlasting contribution, we prayerfully, but with pain and tears, remember our brothers and sisters, Orthodox Serbs in Kosovo and Metohija, the occupied holy Serbian land, as well as the Serbs from the Krajina, who were exiled from there in 1995! Let us also remember, prayerfully and co-suffering with them, all those who suffer in Syria and throughout the Middle-East! Let us also remember all victims of cruel “transitions”, soulless privatization and social injustice in all its manifestations! All of us need to look up to Holy Emperor Constantine in his care for poor, widows, hungry and weak, as well as the remarkable philanthropic and charitable work of the Church in those first centuries. All of you, our dear spiritual children, receive readily and joyously, as did Saint Constantine the Great, Christ’s Holy Gospel! Hear the voice: By this you will conquer! – conquer by the Cross of Christ, through which joy has come into all the world! May every human heart be enlightened with the honorable and life-giving Cross of the Lord! It has transfigured and has brought meaning to the cosmos and history. It is the eternal symbol of Christ’s victory over evil, sin and death. The Resurrection is not possible without the Cross, and whoever worships the Cross of Christ and lives by it, partakes in the Resurrection of Christ, in His victory over “the ruler of this world” (St. John 12:31), over his darkness, deceits and injustices. May this celebration of the completion of seventeen centuries from the day when the truth of the Christian faith began to shine like Sun be to all of us cause to comprehend the greatness of the event we celebrate! The fruit of that miraculous event is the fulfillment of the apostolic mission of the Church in the world. Join us, dear spiritual children, in this celebration! May each day of ours be a new celebration of Christ the Lord, and in Him a celebration of this event! Let us be co-workers of Christ in the work of the salvation of the world! Let us be, at least in some small measure, witnesses of Christ’s love and unity in Christ our Lord, and in all-victorious power of His life-giving Cross! Amen. Given in Nis, the city of Constantine, on the feast day of Holy Emperor Constantine and Empress Helen, May 21/June 3, 2013.